Conservationists are calling for support to protect a major wildlife sanctuary in Myanmar’s northern Karen state they say is threatened by a China-financed dam on the Salween river. Plans to dam the Salween, the longest river free from dams in mainland Southeast Asia, remain controversial, with seven dams proposed for the Salween’s main stem. But it is the 1,365 megawatt Hatgyi that is seen as threatening two wildlife sanctuaries in northern Karen State. The dam is a joint venture between China’s Sinohydro and Thailand’s Electricity Generating Authority (EGAT). Saw Paul Sein Twa, executive director of Karen Environmental and Social Action Network (KESAN), said the dam is a direct threat to the sanctuary and is calling for a moratorium on the project. 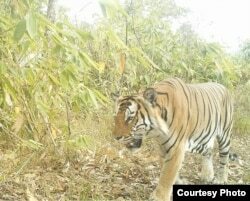 “The dam will flood the area where we have found so many species, including tigers, we need to really preserve. We need to do more research, survey to find out their status,” he said. “We have found some already but we need to do more. So this area will be flooded before we can do much work on the ground. That’s why we are calling for a moratorium to stop it and look into this study of the wildlife,” Saw Paul told VOA. In a February 6 edition of Oryx Journal, co-authors Saw Sha Bwe Moo, Graden Froese and Thomas Gray, detailed results of research investigating the sanctuary area. They said from a total of 9,511 trap nights they obtained 4,191 records showing tigers, leopards, the Asian black bear and elephants. At least 17 of the 31 species found are considered as near threatened, vulnerable or endangered on the International Union for the Conservation of Nature (IUCN) “red” list. The five-year study has drawn international support, including from the World Wide Fund for Nature (WWF), European zoological associations and the Australian non-government organization Wildlife Asia. Wildlife Asia director Clare Campbell said protecting the region from growing threats, including development and poaching, requires international support. “Threats are emerging all the time and some of those threats are going to take fairly considerable resources and international awareness and attention as well as if the local community is able to see out their vision for the landscape which may be a little different from a foreign developers’ vision,” Campbell told VOA. A program to protect the sanctuary against poaching led to the creation of teams of local Karen undertaking anti-poaching patrols, often with the armed backing of the Karen National Union (KNU) militia. Campbell said they are looking to expand the teams’ area of coverage but will require greater resources. Myanmar’s central government has reached cease-fire agreements with several ethnic armies, including the Karen, while political stability and reform has opened the economy to development. But a reduction in conflict has opened the way for animal poaching and trafficking. Since 2012 Myanmar has reported a tenfold increase in elephant poaching to around 25 to 30 a year, with authorities blaming a lack of information and ongoing demand for animal parts, especially from China. Deforestation has also taken its toll. Myanmar is reported by the U.N.’s Food and Agricultural Organization (FAO) to rank only behind Brazil and Indonesia in forest loss. 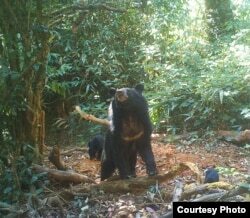 But conservationists fear China’s growing influence may lead to a loss of support from the Karen leadership to continue to support the sanctuary through Karen National Liberation Army (KNLA), the armed wing of the KNU. During recent cease-fire talks, KNU chairman Mutu Say Poe recently became the first Karen rebel leader to visit China. KESAN’s Saw Paul says there are concerns over the KNU possibly abandoning support for the sanctuary. “We worry about the Chinese side might raise this project [sanctuary] in relation to their cooperation with the KNU or in the peace process. I don’t know. But of course since this dam’s major stakeholder is China, the second is EGAT of Thailand, so we do have that concern,” he said. VOA was unable to reach KNU officials for comment on this story. In a bid to dissuade the government from backing the Hatgyi dam construction, the Karen have launched the Karen Wildlife Conservation Initiative (KWCI) to promote alternative development. The KWCI brings together the Karen Forestry Department, KESAN, and Wildlife Asia. The project, known as a Peace Park, earmarks an area down to the dam site as a Karen cultural and community reserve as well as a wildlife sanctuary. “The program we are looking at now is an alternative to the government’s big development projects,” he said.